Traditional sliding sash windows have been installed in buildings throughout the UK for centuries. Despite the age of the design, their popularity has never diminished and they are still installed today in everything from small domestic dwellings to large public buildings. Buckingham Palace and Downing Street are two of the finest examples of buildings that are fitted with the sliding sash. Fortunately this is a window that has stood the test of time whilst adding great character to the buildings they occupy. The recognition of this character means they are commonly insisted upon in listed buildings and conservation areas by local authorities, but they’re also extremely popular with the general public and have even proved a favourite in newly constructed homes. However, although the sliding sash window is almost certainly the most durable of timber windows ever made, nothing lasts forever and they must eventually be replaced. 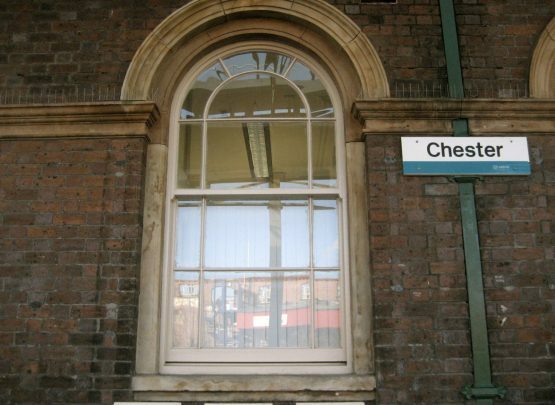 We have manufactured traditional sliding sash windows of all sizes and designs for many commercial and domestic customers over the years, but few have been quite as unique as what we replicated for Chester Train Station. Although it is common for sash windows to have glazing bars, marginal lights and even curved tops, it’s not so common to see all of these features in one window as in the design at Chester. The craftsmanship contained within the sash windows at the train station would command the respect of any modern day carpenter as they were manufactured without much of the high powered machinery which we enjoy today. Nevertheless, replicating the windows still posed a challenge because the glazing bars were extremely thin and could easily break during the initial glazing or glass replacing in later years. A glazing bar sits inside the main frame and has a rebate section removed on each side to accommodate the glass. It’s this rebate that leaves a very thin and susceptible piece of timber which can easily break away, especially if the glass is broken after the window is installed and the putty has to be hacked away. After some discussion we decided that the best way to ensure long lasting strength to this likely weak point was not to manufacture the glazing bar in one piece as the original design, but to make the back of the bar with a central channel and insert a purpose made rebate. The two part design overcame the weakness without compromising the design in any way and all of the replacement windows were manufactured to this specification. The new replicas of the original design were stronger with a smoother opening action and provided a far superior seal against the elements.